While the summit meeting between North Korean dictator Kim Jong-un and President Donald Trump ended with no deal being made on Pyongyang’s de-nuclearization, it was not the first time Americans were engaged by North Koreans in Vietnam – the Americans just did not know it. It was 52 years ago, during the Vietnam war, that U.S. pilots were secretly engaged by North Korean pilots. As such, it will be interesting to see if Kim, who will remain in Vietnam until March 2nd, makes an effort to visit their memorial before his return to Pyongyang. While there is some debate on specifics, it appears it was in late 1996 or early 1967 when Pyongyang offered to send dozens of its pilots to help North Vietnam fight the Americans. 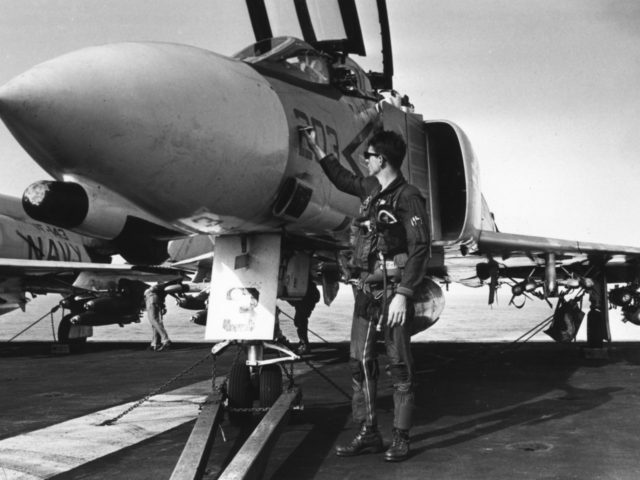 Estimates are that somewhere between thirty to ninety pilots were sent after Hanoi reluctantly agreed. So as not to reveal North Korea’s participation in the conflict, their pilots wore North Vietnamese uniforms and flew North Vietnamese aircraft. All fourteen of the North Korean fighter pilots who flew up to engage their American counterparts were shot down. Appreciative of North Korean pilots’ willingness to help, the North Vietnamese quickly recognized Korean training had failed to adapt to modern aerial combat tactics. As a result, while the Koreans were paying a heavy price in lost personnel, the Vietnamese were paying a heavy price in lost aircraft. Although North Korean dictator Kim Il Sung felt his pilots were expendable, North Vietnamese leader Ho Chi Minh felt differently about the planes. Accordingly, after only two months in the country, Hanoi respectfully told the Koreans thanks, but no thanks, requesting they return home. The fact that U.S. fighter pilots were engaging North Korean fighter pilots was not discovered until decades later. Only after a war museum in Hanoi posted a photograph of North Vietnamese pilots thanking a group of North Korean pilots for their assistance was the latter’s role realized. The North Korean pilots were buried by their fellow North Koreans in a rather bizarre funeral ritual. One of the Vietnamese pilots who attended such a ceremony shared his observations. He explained the deceased was placed in a coffin on a bed of rice and dry tea, with dried fish placed at his feet. A small hole was drilled into the coffin’s lid, situated just above the deceased’s mouth. The Korean mourners then slowly paraded around the coffin, eating dog meat and periodically crying out in anguish. As they reached the head of the coffin, they received a thimble-sized glass of wine. They drank half and poured the remainder into the hole in the coffin lid. The Koreans were buried at a cemetery in Bac Giang Province, located about thirty miles east of Hanoi. Their gravesites all faced northeast, toward their homeland. Although a nearby sign in Vietnamese that reads, “Here used to lie 14 North Korean comrades” suggests the remains have since been repatriated, there is a possibility they still have not been. While a Vietnamese veteran who fought for South Vietnam recognizes the sacrifice these North Korean pilots made, it will be interesting to see if Kim Jong Un makes any effort to recognize the sacrifice made by fourteen of his countrymen, long before he was even born, by visiting their gravesite before departing Vietnam. It would be a gesture much appreciated by his military; however, as a dictator, recognizing the sacrifices of others is fairly low on one’s “to do” list.